It can be observed that x = 0, y = 4 and x = 4, y = 0 are solutions of the above equation. Therefore, the solution table is as follows. The graph of this equation is constructed as follows. It can be observed that x = 4, y = 2 and x = 2, y = 0 are solutions of the above equation. 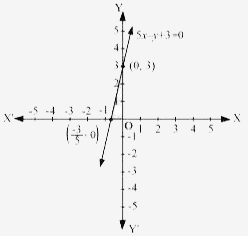 It can be observed that x = -1, y = -3 and x = 1, y = 3 are solutions of the above equation. It can be observed that x = 0, y = 3 and x = 1, y = 1 are solutions of the above equation. Question-2 :- Give the equations of two lines passing through (2, 14). How many more such lines are there, and why? It can be observed that point (2, 14) satisfies the equation 7x − y = 0 and  x − y + 12 = 0. Therefore, 7x − y = 0 and x − y + 12 = 0 are two lines passing through point (2, 14). therefore, there are infinite lines of such type passing through the given point. Question-3 :- If the point (3, 4) lies on the graph of the equation 3y = ax + 7, find the value of a.
Question-4 :- The taxi fare in a city is as follows: For the first kilometre, the fare is Rs. 8 and for the subsequent distance it is Rs. 5 per km. Taking the distance covered as x km and total fare as Rs y, write a linear equation for this information, and draw its graph. It can be observed that point (0, 3) and (-3/5, 0) satisfies the above equation. Therefore, these are the solutions of this equation. the fare paid for that distance respectively and these quantities may not be negative. 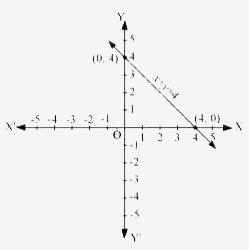 Hence, only those values of x and y which are lying in the 1st quadrant will be considered. Points on the given line are (−1, 1), (0, 0), and (1, −1). 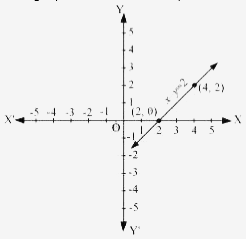 It can be observed that the coordinates of the points of the graph satisfy the equation x + y = 0. 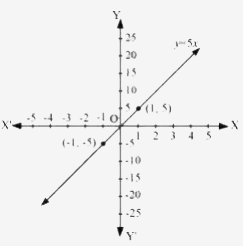 Therefore, x + y = 0 is the equation corresponding to the graph as shown in the first figure. Hence, (ii) is the correct answer. Points on the given line are (−1, 3), (0, 2), and (2, 0). 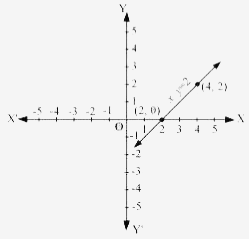 It can be observed that the coordinates of the points of the graph satisfy the equation y = − x + 2. 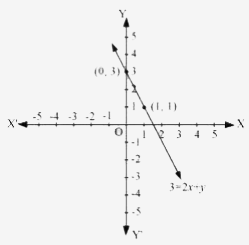 Therefore, y = − x + 2 is the equation corresponding to the graph shown in the second figure. Hence, (iii) is the correct answer. Let the distance travelled and the work done by the body be x and y respectively. It can be observed that point (1, 5) and (−1, −5) satisfy the above equation. 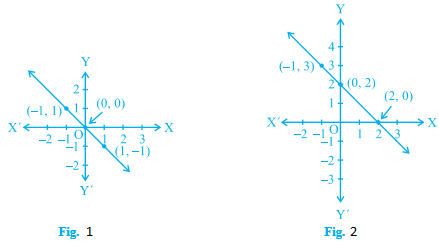 (i) From the graphs, it can be observed that the value of y corresponding to x = 2 is 10. This implies that the work done by the body is 10 units when the distance travelled by it is 2 units. 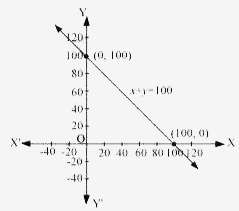 (ii) From the graphs, it can be observed that the value of y corresponding to x = 0 is 0. This implies that the work done by the body is 0 units when the distance travelled by it is 0 unit. Question-7 :- Yamini and Fatima, two students of Class IX of a school, together contributed ` 100 towards the Prime Minister’s Relief Fund to help the earthquake victims. Write a linear equation which satisfies this data. (You may take their contributions as Rs. x and Rs. y.) Draw the graph of the same. Let the amount that Yamini and Fatima contributed be x and y respectively towards the Prime Minister’s Relief fund. It can be observed that (100, 0) and (0, 100) satisfy the above equation. Therefore, these are the solutions of the above equation. The graph is constructed as follows. Yamini and Fatima respectively and these quantities cannot be negative. It can be observed that points (0, 32) and (−40, −40) satisfy the given equation. Therefore, these points are the solutions of this equation. The graph of the above equation is constructed as follows. Therefore, the temperature in Fahrenheit is 86°F. Therefore, the temperature in Celsius is 35°C. 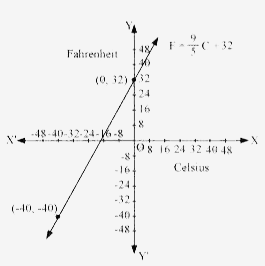 Yes, there is a temperature, −40°, which is numerically the same in both Fahrenheit and Celsius.